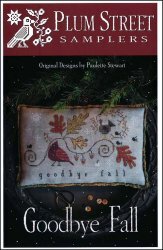 Goodbye Fall [C6214] - $10.00 : Yarn Tree, Your wholesale source for cross stitch supplies. Cross stitch pattern from Plum Street Samplers. Leaves have turned color & are starting to fall, while little white snowflakes start to decorate the sky. A tree branch with an array of beautiful colored leaves & acorns hanging down, is stitched in the middle of this design. A cardinal, a turkey & black birds stand on the tree branch, wondering where the white "stuff" came from! "Goodbye fall," until we see you again! Stitch count 164w x 100h.